It's impossible for any organization or business to do a great job being for everyone. We're more successful when we target particular communities or audiences and design experiences for them. How do you reconcile the desire to be inclusive with the practical imperative to target? In the past, I've subscribed to the theory that an organization should target many different groups and types of people to serve a constellation of specific audiences across diverse affinities, needs, and interests. But ultimately, that's still targeting. It's still grouping. And while it may be effective when it comes to marketing, it's limiting if your mission is to reach and engage with a wide range of people. 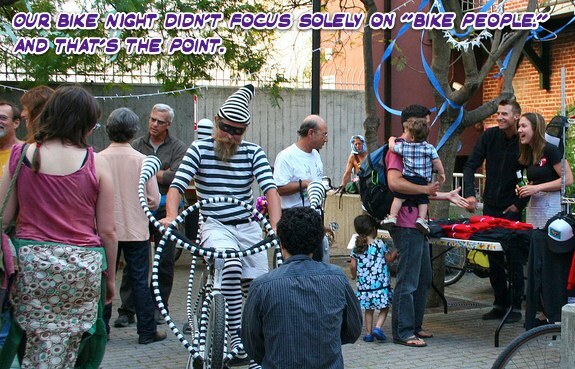 It can lead to parallel programming: bike night for hipsters, bee night for hippies, family night for kiddies. And rarely the twain shall meet. At the Santa Cruz Museum of Art & History, we're approaching this challenge through a different lens: social bridging. One of our core programming goals is to build social capital by forging unexpected connections between diverse collaborators and audience members. We intentionally develop events and exhibitions that matchmake unlikely partners--opera and ukelele, Cindy Sherman and amateur photographers, welding and knitting. Our goal in doing this work is to bring people together across difference and build a more cohesive community. We have been explicitly focusing on social bridging for more than a year now. What started as a series of experiments and happy accidents is now embedded in how we develop and evaluate projects. We've seen surprising and powerful results--visitors from different backgrounds getting to know each other, homeless people and museum volunteers working together, artists from different worlds building new collaborative projects. Visitors now spontaneously volunteer that "meeting new people" and "being part of a bigger community" are two of the things they love most about the museum experience. This has led to a surprising outcome: we are now de-targeting many programs. This isn't just a philosophical shift--it's also being driven by visitors' behavior. "Family Art Workshops" suffer from anemic participation whereas multi-generational festivals are overrun with families. Single-speaker lectures languish while lightning talks featuring teen photographers, phD anthropologists, and professional dancers are packed. Programs that emphasize bringing diverse people together are more popular than those that serve intact groups. Why fight it? And so, while we continue to acknowledge that specific communities have particular assets and needs, we spend more time thinking about how to connect them than how to serve each on its own. We're comfortable being deliberately unhip if it means that a seven year old, a seventeen year old, and a seventy year old all feel "at home" at the museum. This approach allows us to sidestep the question of parallel versus pipeline programming and instead create a new pipeline that is about unexpected connections and social experiences. Focusing on social bridging also leads to tricky questions as to how we develop new programming, especially when it comes to outreach. When we offer programs at a school or neighborhood festival or community center, we do it to work with the group who live or learn there. Ironically and somewhat depressingly, our partnerships with marginalized communities often involve more segregated work because of our desire to engage in their space, on their terms. There are some groups who we work with terrifically in their own space but who we rarely engage in ours. This leads to good bonding, but very little bridging. I don't have the answer to how we can incorporate bridging across the various ways we work with intact and blended communities. When it comes to school programs, we are now actively exploring how our approach might shift to emphasize bridging--among students in the same school, among students from different schools, among students across their school and home life. When it comes to working with intact cultural and ethnic communities, one of the resources that is helping me think through these questions is a 2004 paper by Dr. Pia Moriarty on Immigrant Participatory Arts in Silicon Valley. In the paper, Dr. Moriarty puts forward a paradigm of "bonded-bridging" to describe the way that ethnically-identified programs and organizations contribute to bridging in a majority-immigrant community. It's a thoughtful and intriguing paper, and I encourage you to read it. I'm still chewing on the idea of "bonded-bridging" and the limitations and possibilities of a bridging strategy in a diverse community. But for now, I'm happy that we've been able to address some of our hand-wringing over targeted programs and inclusion with an approach that serves both our visitors and our core goals. Does social bridging make sense for your institution? How do you reconcile inclusion and targeting in program design?